It’s quick and easy to get a library card. It takes just three steps. 1. Present a photo I.D. (such as a driver’s license, Mississippi Identification Card, United States Armed Forces card, or passport) to a librarian at the main desk of any KNRLS location. 2. If your photo I.D. does not have proof of current address on it, please also bring in some official correspondence with your name and address printed on it (for example, the USPS Change of Address letter, a gas bill, or a signed lease). 3. Fill out the KNRLS library card application. It’s about the size of an index card and doesn’t take long to complete. And that’s it! You’re done! You can now add one of the most valuable cards you’ll ever own to your wallet. If you’re under age 14, you do have to add a fourth step: Get your parent or guardian to sign the form giving you permission to get a card. If you’re under 14 and you received your card at school when a librarian visited, getting a parent/guardian to finish signing you up at the library is the only thing you need to do. 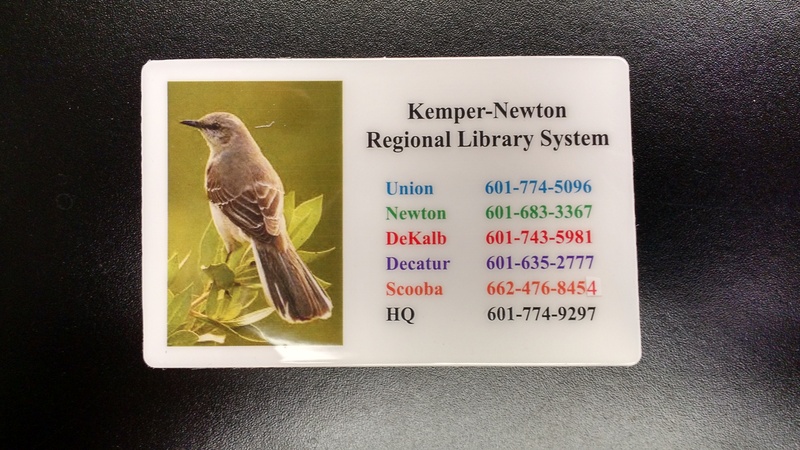 If you do not have an address, see the library director at HQ in Union or call 601-774-9297 to request a card which will allow you to access to many library services.